Suggestions that freedom of movement will continue after the UK leaves the EU are wrong, Downing Street has said. On Friday, Chancellor Philip Hammond warned full controls could take "some time", prompting speculation free movement may continue in all but name after the UK leaves in March 2019. But amid claims of splits in cabinet, No 10 has moved to make clear free movement will end when the UK leaves. It said: "It would be wrong to suggest it... will continue as it is now." Downing Street's move followed days of uncertainty over future immigration policy during any transitional phase after Brexit. The PM's spokesman said plans for a registration system for migrants arriving after March 2019 had been set out last week, and Prime Minister Theresa May had raised, as long ago as January, the prospect of a transition period before the post-Brexit system was implemented. At the moment, citizens from the other 27 EU member states have the right to come and work and live in the UK. Ministers have said Brexit will enable the UK to control who comes to the country and in what numbers but there has been debate within government about how quickly this will happen and what its impact will be. Mr Hammond has said the cabinet is united behind the need for a transitional period of up to three years after Brexit, a period of time in which he said many arrangements would "remain very similar to how they were the day before we exited the European Union". He has said his goal is to minimise the level of disruption to British business and consumers, by retaining access to European markets both for goods and workers. But International Trade Secretary Liam Fox has warned that allowing unregulated EU immigration to continue would be a betrayal of last year's referendum result, while a former Brexit minister, David Jones, suggested some ministers were being "kept out of the loop" by No 10 and the Treasury. No 10 said the shape of post-Brexit immigration controls would become clearer in due course, with legislation due to be presented to Parliament later this year. "It would be wrong to speculate on what these might look like or to suggest that freedom of movement will continue," the spokesman said. "Free movement will end in March 2019. We've published proposals on citizen's rights. 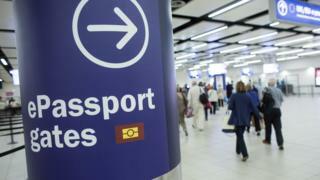 Last week the home secretary set out a registration system for EU nationals arriving post March 2019." We've had days of rival ministers setting out their different views, with former Remain ministers the loudest - the chancellor saying there might have to be a three year transitional period after the UK leaves and the home secretary saying EU migrants will still be able to come to the UK provided they register. Downing Street has now decided that enough is enough and that it is time to stop the bickering. Number 10 says the plan is as Theresa May set out in her big speech at the start of the year. But will this attempt by No 10 to reassert control work? There are two reasons why this might prove tricky. The first is the diminution in Mrs May's authority after the election; the second is that there remain very profound differences between the ideologues, who believe the UK must leave to regain sovereignty, and the pragmatists who think the UK's economic well-being comes first. Downing Street also rejected the possibility of an "off-the-shelf" trade deal with the EU such as that enjoyed by Norway and other members of the European free trade association - which grants them access to the single market. The idea has been floated by Mr Hammond among others. Cabinet ministers have also sought to play down talks of rifts and factions within Theresa May's top team over the terms of any transitional deal. Defence Secretary Sir Michael Fallon said future immigration rules would be decided as part of the current Brexit negotiations and dismissed suggestions there were "arguments raging around the cabinet table" while Health Secretary Jeremy Hunt insisted the NHS must still be able to recruit new staff from across Europe. Lib Dem leader Vince Cable has claimed there is a "deep, unbridgeable chasm" between what he has characterised as Brexit "fundamentalists and pragmatists" within the government while Labour's Peter Dowd said the government had "broken down into farce".